Listen up, bloggers. Income Statements aren't scary. They're simple, they're informative, and they're a powerful tool for your business decision-making. And, believe it or not, you owed your blog a proper Income Statement the exact month you first spent money on it. So if you purchased your domain 6 months ago and you've never created an Income Statement for your blog, you've got 6 months of work to do! But don't sweat it! DIYing your own Income Statements really isn't that complicated. And I'm always here to help! First, you'll notice I tend to say "Profit & Loss Statement" throughout this post. 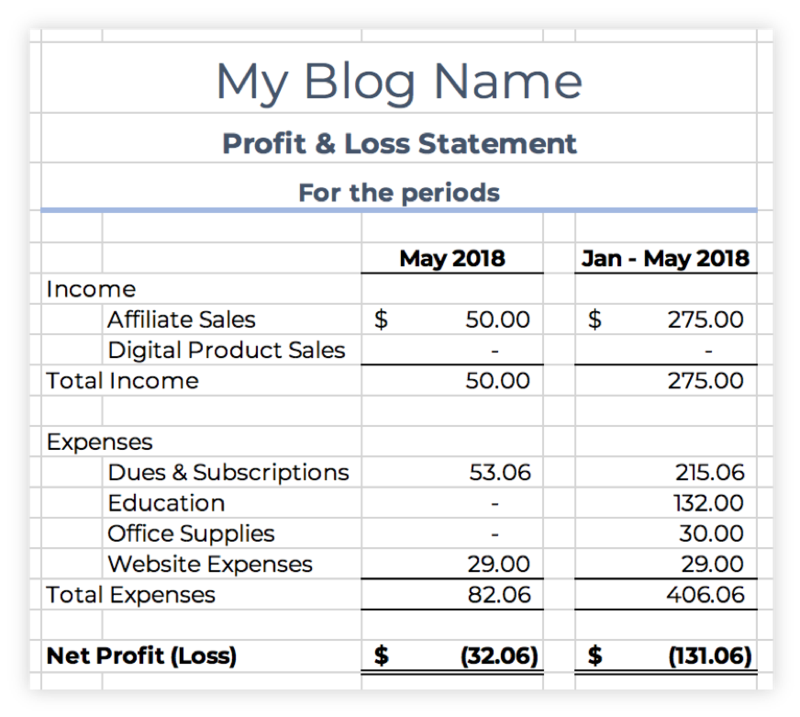 Income Statement is less wordy and tends to be the name people recognize, but we used Profit & Loss (or P&L) at work all the time, and it's what my accounting software uses, so that's how I tend to refer to it. Just know that they're the exact same thing! Secondly, know that this blog post is not professional accounting advice. My accounting background does not mean that I am your accountant. This blog post is simply advice from my own personal experience. Consult a professional before making any major legal or financial decisions for your business. I suppose we ought to make sure we're all on the same page about an Income Statement first! An Income Statement (or Profit & Loss Statement) is a financial report that shows your Revenue minus your Expenses. Simple as that! All the money you earned, minus all the money you spent, which equals your net profit or loss. This statement is all about showing your business' performance over time. Essentially, it tells you if your business is doing its job right! I recommend preparing monthly Income Statements. This may seem tedious and unnecessary during the early stages when you have less money moving around, but you'll be grateful for the detail as time passes! Plus it'll line up super nicely with your bank statements, which makes the entire bookkeeping process more streamlined. Step 1. You need a record of your transactions. It's pretty difficult to create a report of your transactions without any record of your transactions. You're going to need to compile your data for whatever time frame you're working with today. I recommend just starting with last month. It's recent data and should be easy to compile! Do you have a separate checking account for your blog? Congratulations, you get a gold star! Your job will be made much easier today. All you need is to open your online banking and/or grab your last month's bank statement. If you don't have a separate account, I'm officially forgiving you. But I'm also going to push you over to this blog post right here that I need you to read now: The Best Time to Open a Blog Bank Account. Read that first, add "open new checking account" to your to-do list for TODAY, then I give you permission to continue reading! You're going to need to gather all your data from wherever you've been spending and receiving blog money. Most likely, this is your personal checking account - open your online banking and/or your bank statement and start identifying anything blog related! This is pretty simple if you don't have many transactions, but if there's a lot, you may want to grab a highlighter, print your statement, and start highlighting! If it had anything to do with your blog, it counts! If you're not sure, highlight it anyway and address it later. If you purchased anything blog related with cash, (cute office supplies from Target, perhaps? ), either find the receipts or write down your best guess for the amounts. Estimates are not ideal, but they're better than ignoring the transaction altogether! Step 2. Identify your Revenue. Your revenue is any money your business earned. Not money that you put in. If you transferred money to your business' bank account, that's not income. If you paid for a business expense with cash from your wallet, that's not income. If you got a refund on something you paid for, even if it was for business, that's not income (that'll simply reduce the expense account where you would have originally categorized the money going out). If you generated an affiliate sale, it isn't income on your books until the cash hits your bank account. A lot of affiliate sales don't go through, and a lot of affiliate programs have 30+ day payouts. You'll count the income when it hits your bank, and no sooner! Once you've identified your income categories, find any income transactions among your bank deposits! Start recording and labeling using whatever system you're using: handwritten, Excel, or even bookkeeping software (I like Wave because it's free! If you have a separate blog bank account, you can even set up automatic downloads). If you're already feeling overwhelmed or if learning how to use software sounds like a chore, just start with a handwritten system for today. Your job is to start recording the data NOW - the more time that passes, the more likely you'll be to miss things later on! What do I do with the money I put in to my business? For those of you with a separate bank account for your blog, you've probably transferred money in (or out) of your blog's account at some point or another. This money does not go anywhere on your Income Statement. Remember, an Income Statement shows you whether or not your business is doing its job right - making money! Any item on your Income Statement should reflect your business doing what its in business to do - whether that's blog ads, sponsorships, affiliate income, product sales, services, or whatever else your monetization plan involves. You transferring money into your business to keep it afloat is unrelated to that performance level of activity. I'm preparing another blog post to show you how to record this money in your bookkeeping system, but for now, just keep track of it (away from your P&L!). Step 3. Identify your Expenses. The next step involves identifying your operating expenses. This means any money you spent for your business; NOT money you took out. And definitely not money you spent for something personal. Again, if you transferred money out of your business, that's not an expense. If you paid for a personal expense with your business' money, that's not an expense. An expense is anything you paid for that is in some way supporting your business' operations; hence the term operating expense. Accrual-basis accounting means that you record income and expenses when they're earned and incurred. So, when you perform a service that you'll be paid for later, you record the income when you performed the service; when it was earned. If you prepaid an annual software subscription, you'd record the 1/12 of the expense every month as you used the software; as it's incurred. Sound weird? It is, and bloggers don't need to use this. Bloggers should use cash-basis accounting, which essentially means you count the income and expense when the cash moves. So when the money hits the bank or leaves the bank, that's when you record it! Simple! People tend to use accrual-basis income and cash-basis expense (accountant-cringe-moment). 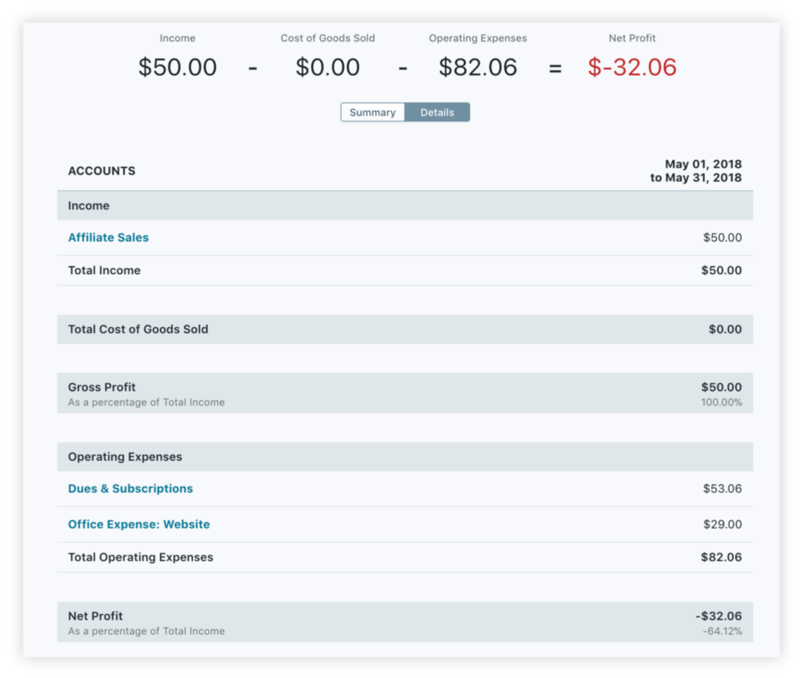 Ever see blogger income reports where they say "I earned $1,000 in affiliate income this month, but I probably won't get paid all that for another month or two..." That's accrual-basis and isn't really the correct way to report that. Then they turn around and list all the expenses that they physically paid out that month. That's cash-basis, which is correct. But you've got to pick one or the other, not both! If you write checks, you can use the check date (which gets used for more accurate reconciliations but don't worry about that just now). But how many of us are writing paper checks for online business? Be sure to reconcile! This can be done very easily in bookkeeping software (again, I use Wave). But if you're using a handwritten system or Excel, it's still pretty easy. Look at your bank statement for the month you're working with. Write down the starting balance from the bank statement. Put the bank statement down and look at your own records. Total up all of the income and any amounts you transferred in from your personal account. Total up all of the expenses and any amounts you transferred out of the account. Take the starting balance you wrote down and add the number you got in Step 3. Then subtract the number you got in Step 4. This number should match the ending balance reported on your bank statement! If it does match, congrats! You've accounted for all transactions in your bank account. If it doesn't match, go back through and see if you missed any transactions or recorded the wrong amount. Also look for double-counted income or expenses; it happens! Note: This step is simply to make sure you didn't miss any transactions. But some of your bank transactions may be those transfers or personal expenses that I told you to leave off of your P&L Statement. So don't expect your P&L to look exactly like your bank statement - the movement of cash is not the same as a report of operating income and expenses. A bank reconciliation would be way more of a chore than it's worth. Instead, you'll just have to walk very carefully through your records to make sure you didn't add or miss anything! And make sure that your amounts are correct! Reconciling a bank account simply lets you know that the numbers are there. It won't guarantee that your Profit & Loss Statement is properly prepared. Be sure to double check that no personal expenses or personal funds transferred in/out have been recorded on your P&L. And look for any mistakes in how you've categorized income or expenses. Step 5. Fancy it up - or use some bookkeeping software! You can make a really nice P&L report on paper, in Excel, or in bookkeeping software. Here's an example of what a simple P&L would look like if you made it from scratch. 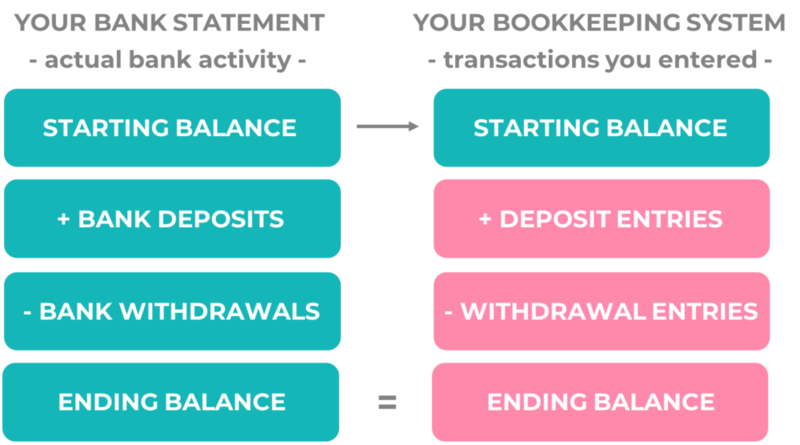 If you're using bookkeeping software (I like Wave, it's free!) to track your transactions, then you should be just a single click away from generating a report! This one's pretty easy, but you want to look and see if your bottom line - your net income/loss is positive or negative! If it's positive, great! You were profitable for that period! If it's negative, there's room to grow! Try and explain why your business went negative this month (or whatever period you're analyzing). Were your expenses too high? Did you have to pay for anything out of the ordinary? You'll start to watch this as you continue to create P&L reports. You'll want to pay attention to how the numbers change by comparing to previous months and/or years. Is income increasing or decreasing? Why? Are you spending more in a certain expense category? Why? Do you need to cut spending, or is it a justified investment? Did you spend less in a certain category? Why? Was it an intentional budget cut, or do you need to start investing in this area again to help your business grow? Now you'll look like an accountant! Take every line item on your P&L, and divide it by the total revenue in a separate column. Revenue will obviously say 100% (since that number is itself). But all your other lines will then show you how much of a portion of your revenue is going to that category! So you can see if 70% of your total revenue is in affiliate income. Or if 92% of your total revenue is being spent on courses (oops!). This is a great way to assess where your money is coming from and where it's being spent. Accounting fun fact: A P&L report with these percentages calculated is called a "common-sized" report. 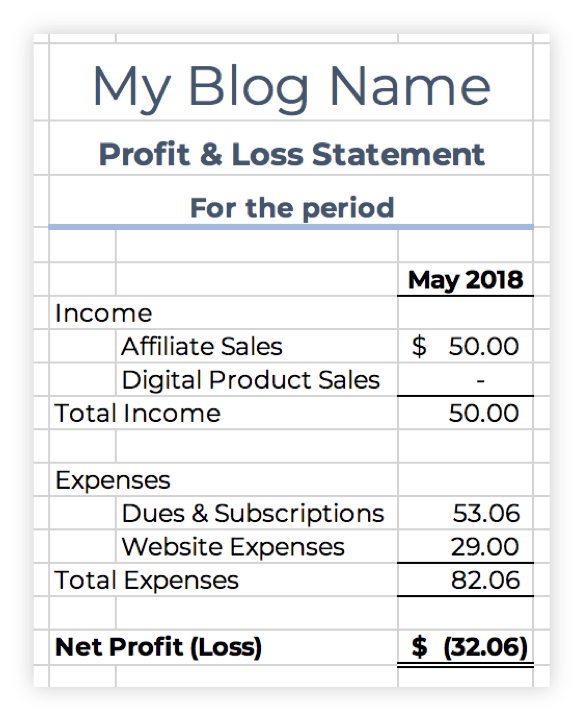 You'll notice that, in the year 2018, this blogger's total expenses are almost 150% of their revenue! Not good! That means all of their business' income, plus an additional amount that equals HALF that number, is going towards expenses. And most of that (78%) is going towards their subscriptions. They need to get their income up and/or reevaluate their monthly subscriptions! Otherwise, they'll be forever transferring their personal funds into their business to cushion its losses and keep paying those subscriptions. And there you have it! Just about everything you need to know to create your own Profit & Loss Statement, which is one of the most important financial statements you need to understand for your business! Get in the habit of creating one every single month. As you compile them, you'll really start to grow familiar with your business activity and it'll be so much easier to spot opportunities for improvement! Plus, it'll be a fun record one day! Get a separate bank account today. This may not help with yesterday's numbers, but it will help tremendously with everything moving forward. Just be sure to change all your subscription information so the business expenses start to come out of its own checking account! Just focus on last month. You can move backwards later, but for now, focus on the present day. If even last month is freaking you out, just get everything recorded for the current month up to today! You won't finalize your P&L until the end of the month, but at least you'll have a record started! Consider scheduling a call with me - this kind of personalized walkthrough of disorganized finances is exactly what my service was designed for! It can be especially useful for creating an action plan to tackle your historical data. I hope this blog post can serve as a resource for you to help you conquer your fear of Income Statements (or bring awareness to the fact that you need them!). It may seem silly to do right now, especially if you only have a few transactions in a month. But now, while it's simple, is the best time to learn. Now is the time where you can make mistakes and learn how to do it when it only takes you 7.3 minutes to do each month. Now is the time!